Saya’s range of clear bags are designed and specially produced to keep them durable, strong and attractive. 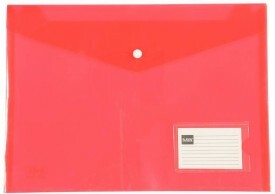 They are best for storing loose papers, documents, notes, catalogues etc. Saya's Unique, Smooth and strong Button closure ensures ease of use and secured filing of contents inside. Its archival safe polypropylene does not stick or lift ink and High Quality cover sheets resists fingerprints and smudges, making it more preferable product in comparison to any other product in the market. The size of this file bag is made to be compatible so that it can store papers easily. The exteriors of each product is made to look professional and classy.It is perfect for regular or shared use, Saya’s Clear Bag are popularly used for:-Classrooms and office use.-Projects and presentations.-Busy people on the move.